After 25 years, the Explorer goes Platinum. The Explorer is a big deal. And not just to Ford. 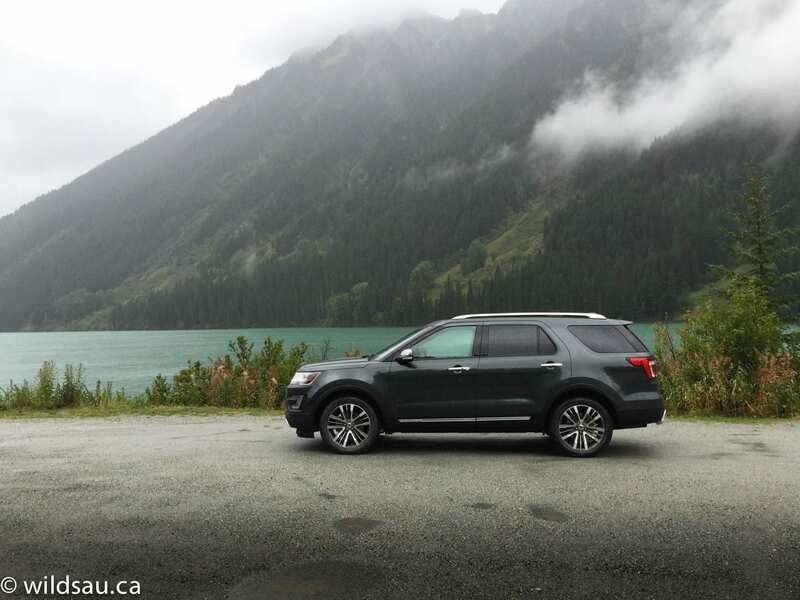 It was the first mainstream SUV and as it navigated the ever-evolving automotive landscape over the last 25 years, it has been sold seven million times. 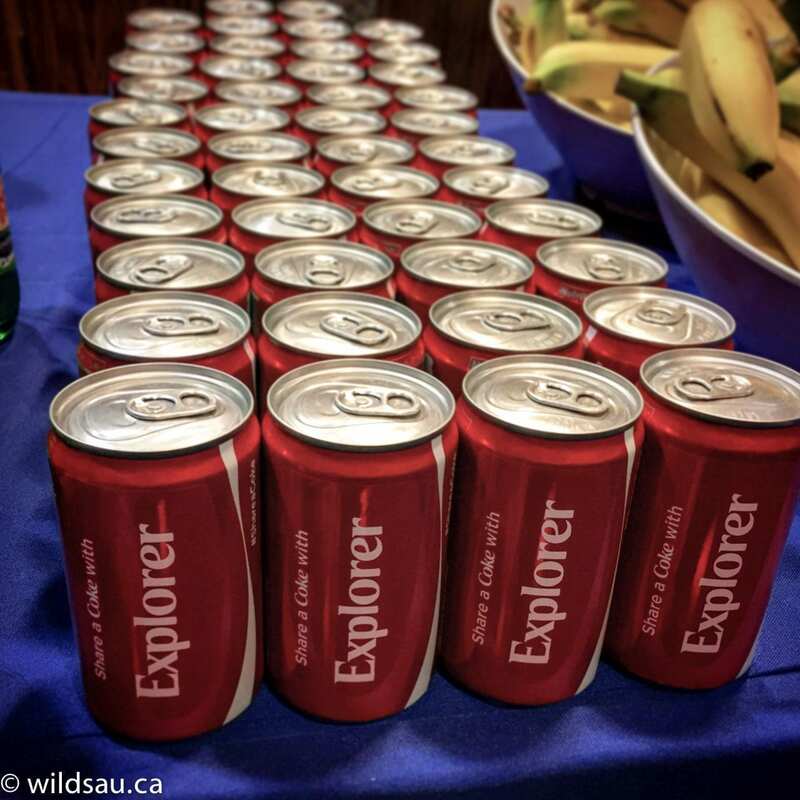 That’s a lot of Explorers! 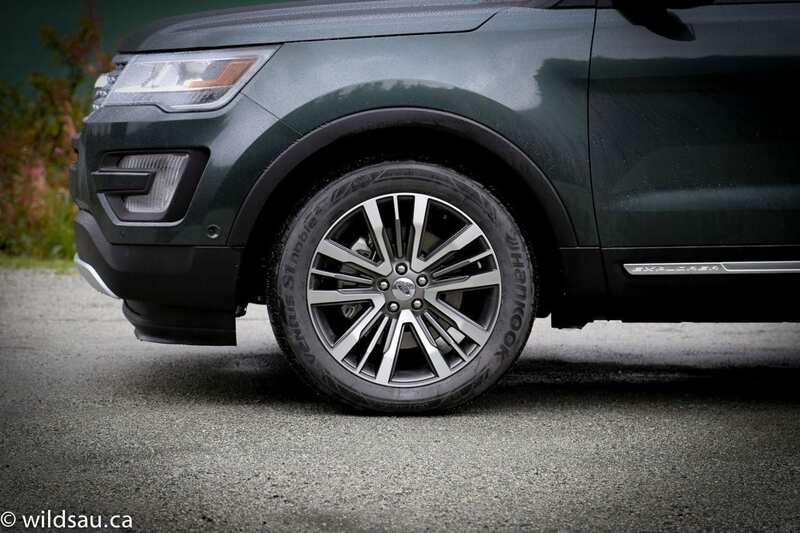 Ford decided to do something special for the Explorer’s 25th anniversary. 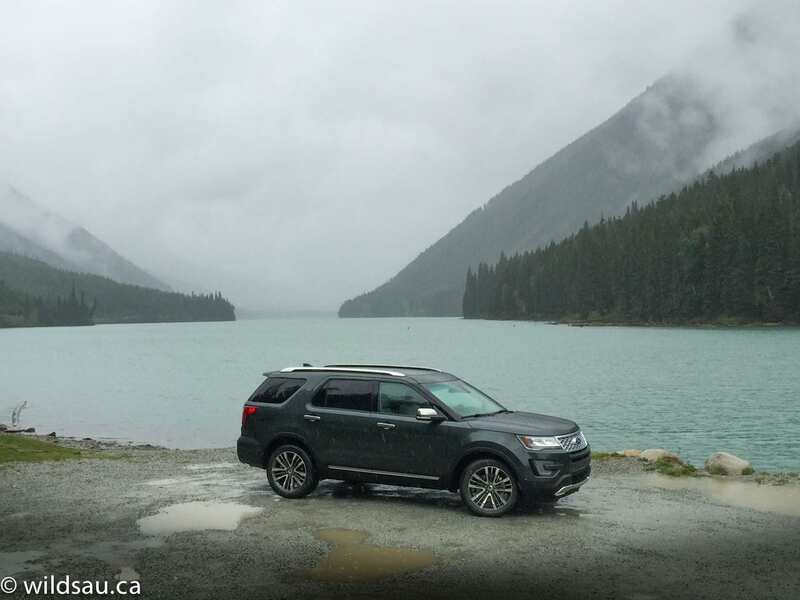 And to check it out, I got to “Explore More” in British Columbia – in the new Ford Explorer Platinum. 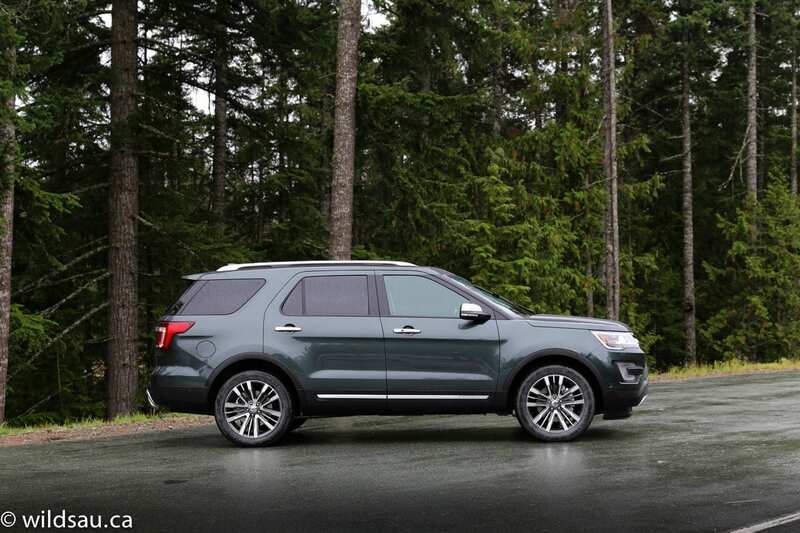 The Explorer’s trim levels used to top out with the Limited, but for this model year, Ford has added the Platinum as the new pinnacle of the line-up. 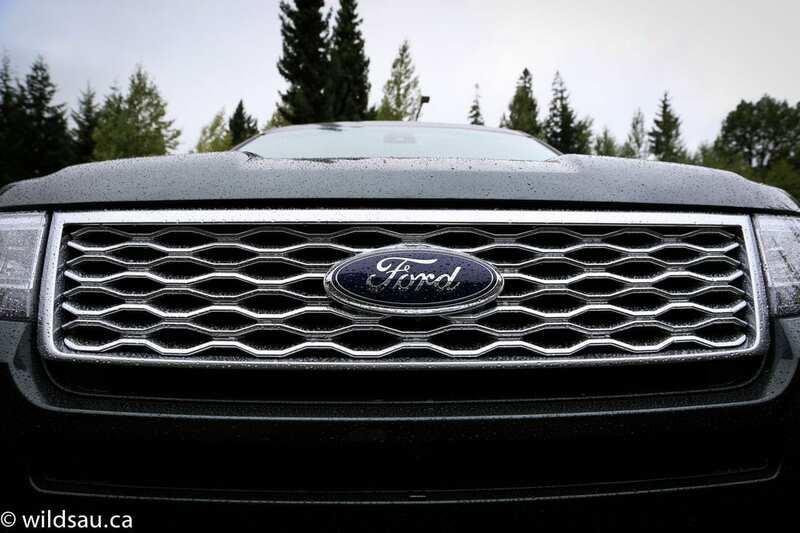 The best way to explain it is that Ford took the best of the loaded-up Limited trim and the best of the surprisingly capable Sport trim, combined it and then cranked it up a notch to make up their new top-of-the-line package. 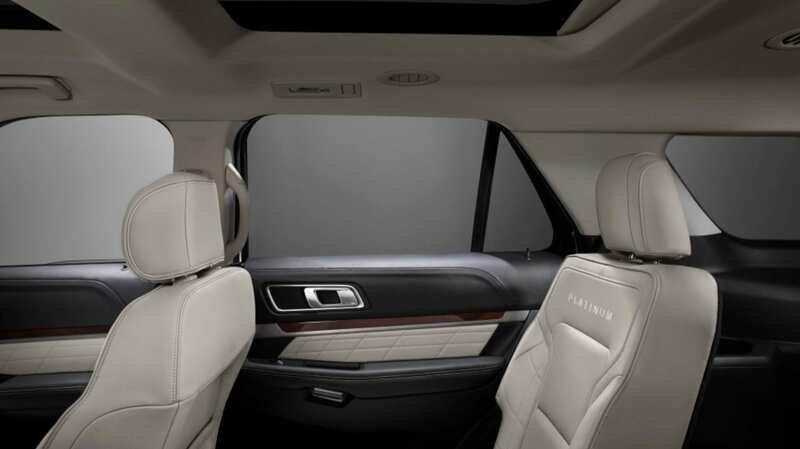 While the Explorer obviously retains the same platform and exterior styling, the Platinum does get some special touches. 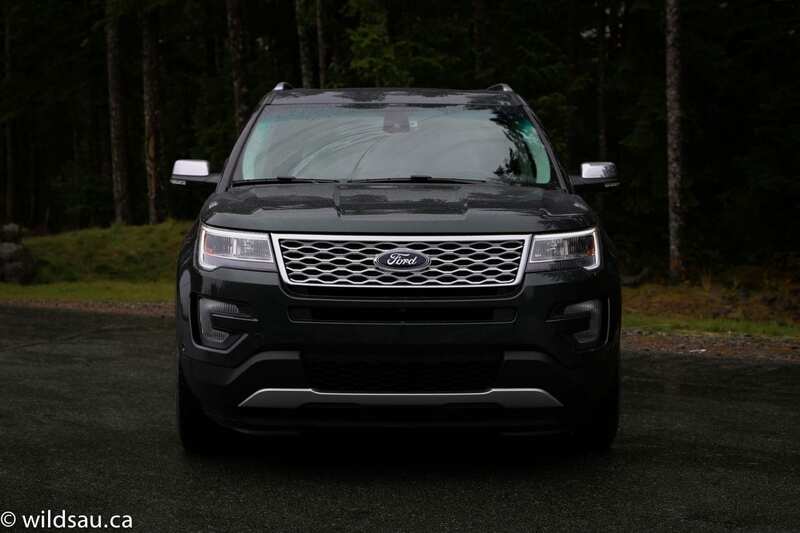 Perhaps the most noticeable is the all-new grille – handsome and slightly aggressive, it’s surrounded by restyled lights. All the chrome details on the Platinum are satin and while there’s quite a bit of it (grille, door handles, sills, roof rails and rear fascia trim), it never gets too blingy. 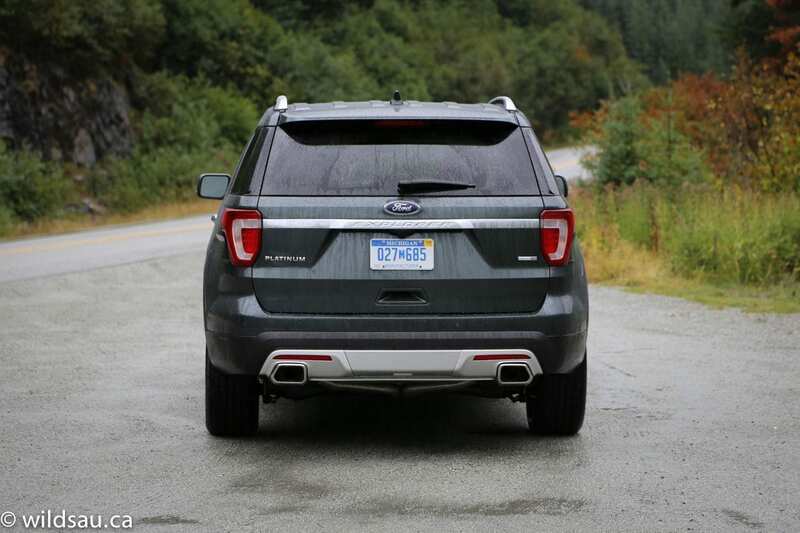 The muscular-looking integrated exhaust tips are new, and both front and rear fascias get skid plates to visually reassure the buyer that they are in fact getting a serious SUV. And yes, those sweet 20-inch rims are Platinum-specific and do a pretty good job of looking classy, rugged and sporty all at the same time. Which, I’m guessing, is exactly what Ford is hoping for. 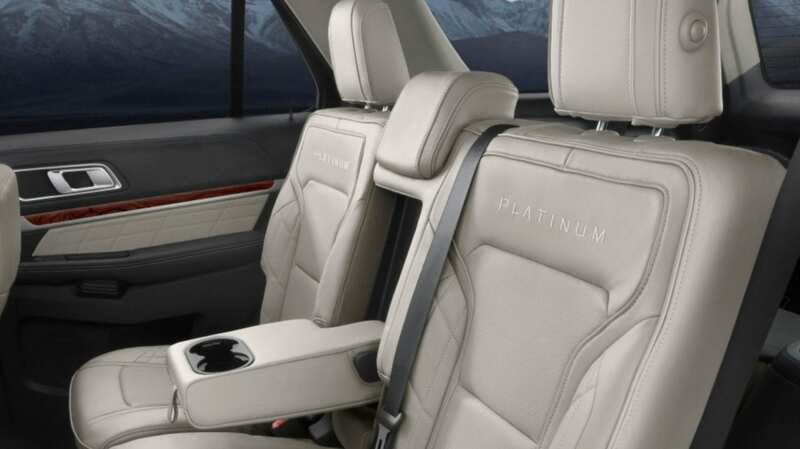 If you’ve been in a current Explorer, the interior will feel familiar, but again, the Platinum kicks things up a notch with some new upscale features. Fit and finish appears to be world-class, and many of the materials are really upper crust. 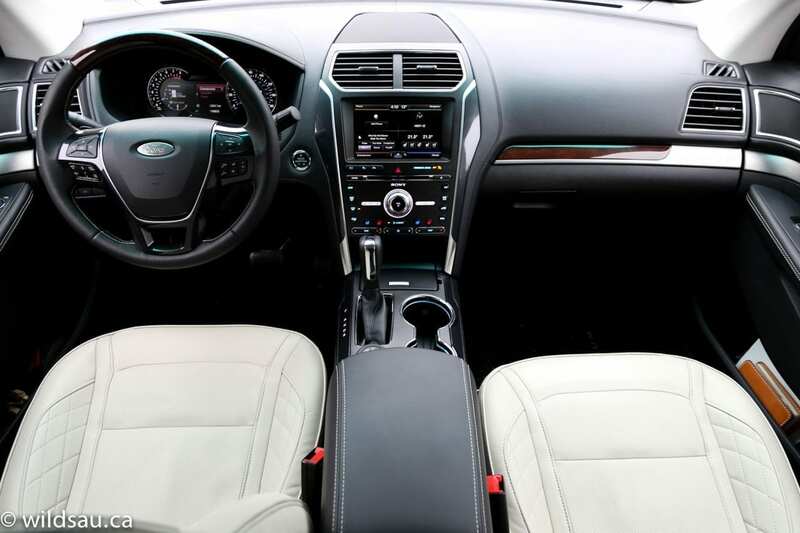 Fancy-shmancy details like a leather-wrapped dash, a heated steering wheel, real ash wood accents, dual-pane sunroof and a digital instrument panel are nice, as are the gorgeous leather seats. In the front they’re heated, cooled, vastly adjustable and offer a massage function and I found them to be tremendously comfortable – even after nearly 10 hours on the road. Want tech? The Explorer Platinum has it all. And then some. Smart-charging USB plugs that charge your devices twice as quickly. ParkAssist that easily pulls this behemoth into (and out of) parallel and perpendicular parking spots. 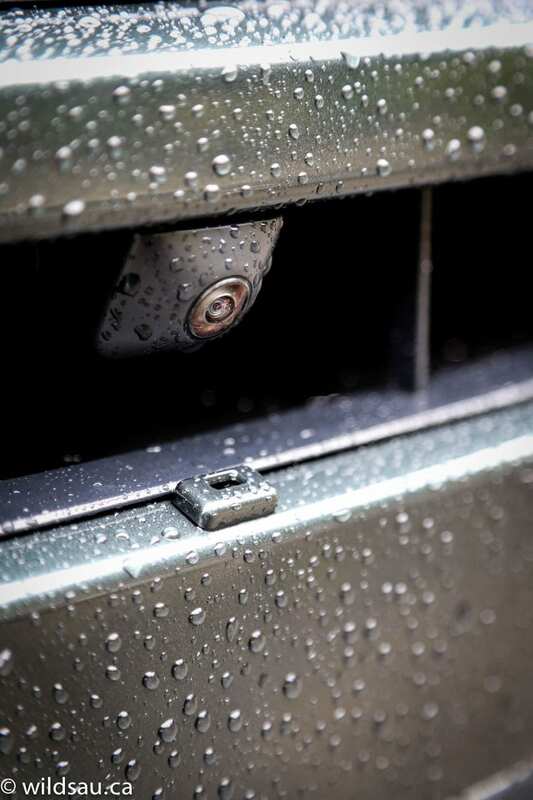 Adaptive cruise control, lane keep assist, blind spot monitoring and on and on. 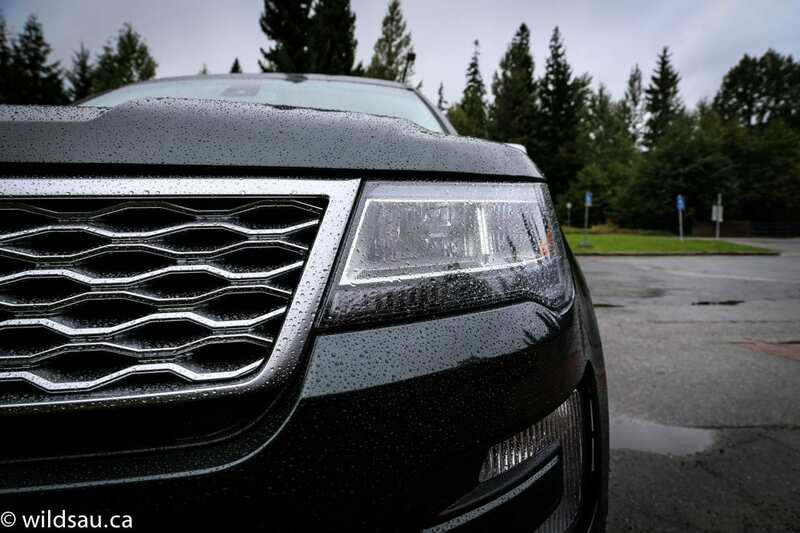 Oh hey, and how about 180-degree cameras in the front and back – that can be washed with washer fluid? Yes, that’s a thing and in Canadian winters, that alone might feel like it’s worth the price of admission into the Platinum world. The easiest way to say it is that the Platinum is fully loaded. 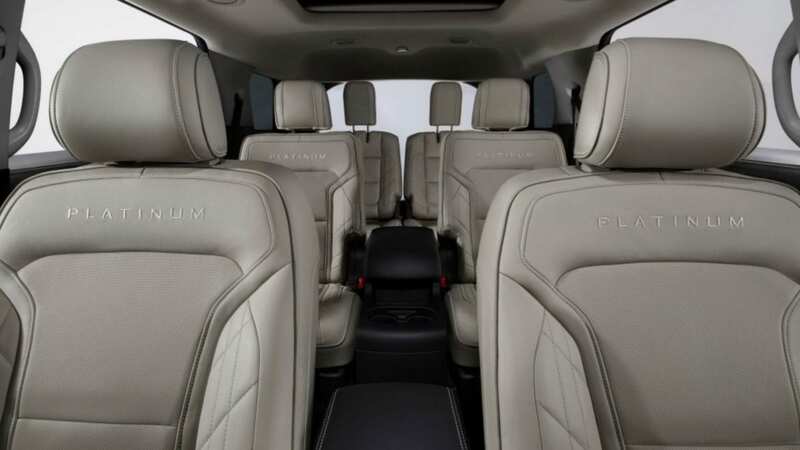 Actually there is only one option for the Platinum trim Explorer – you can choose whether you’d like bucket seats or a bench in the second row. That’s it. And yes, it comes complete with pricing that puts is square into luxury brand territory. The second row wasn’t cramped before, but repackaging things has allowed Ford to increase the knee room here by 1.5 inches. Head room has always been plentiful in the Explorer. 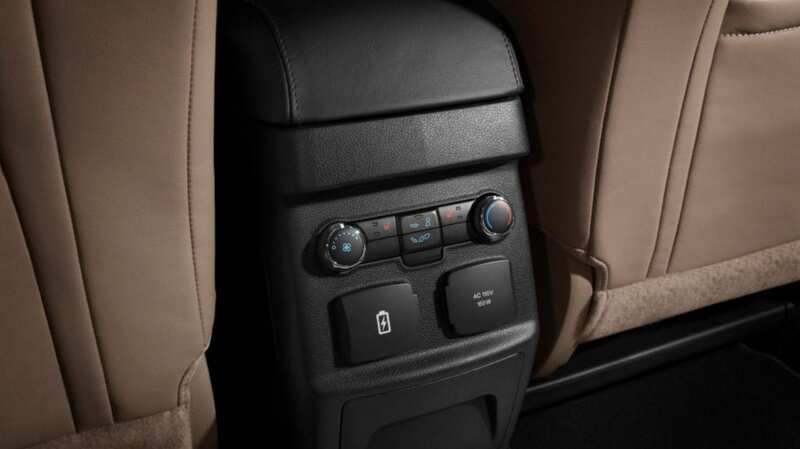 The seats slide fore and aft, recline and are heated – and there are plenty of power ports, including USB and a 110V household plug. 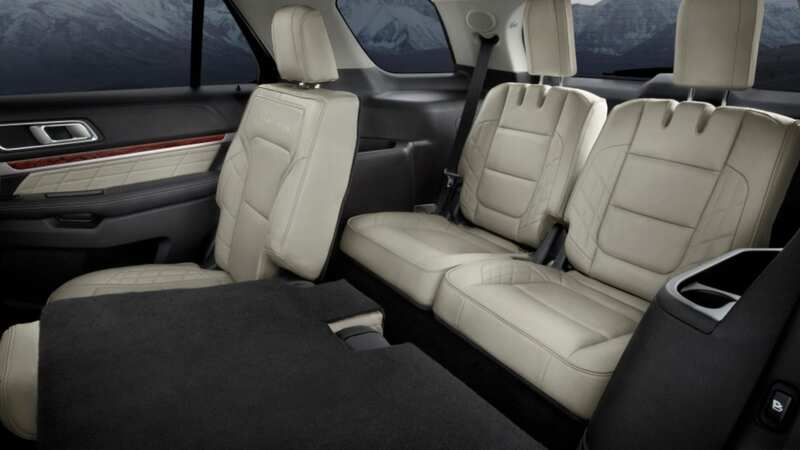 The two seats in the third row are usable for adults, but the wealth of head room doesn’t make up for the lack of both knee room and space for your feet. It’s great for kids though. 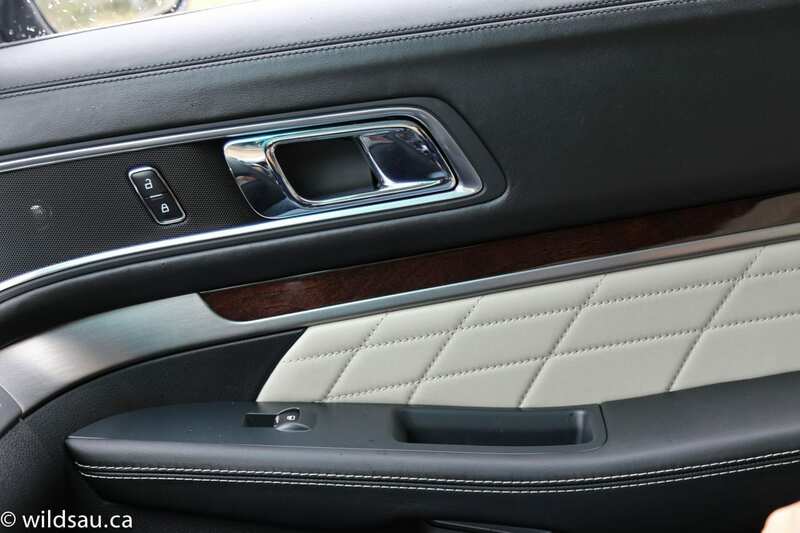 The sizable trunk, which you can open from the dash, your key fob or using the cool Hands-free feature, leaves enough room for several carry-on sized bags even when the third row is in use. Fold the third row down and you’re looking at 1243 litres of cargo space. 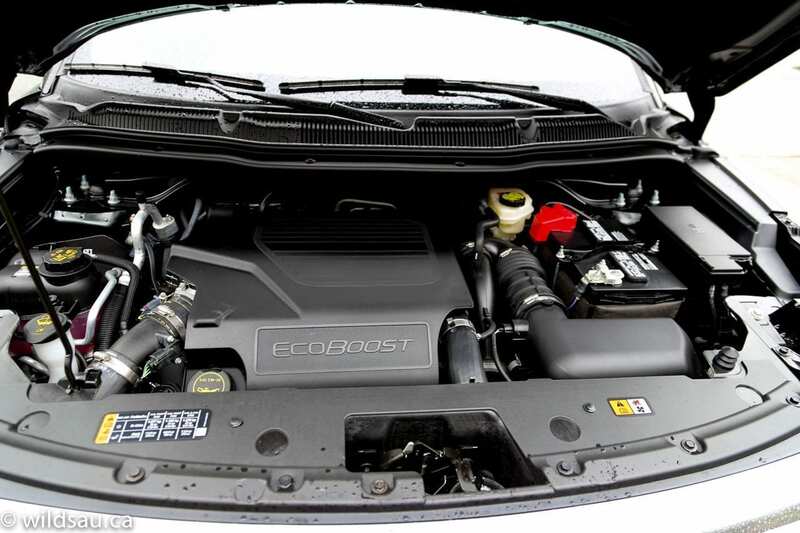 The Explorer Sport always had the upper hand on the road, where its sweet 3.5-litre twin-turbocharged EcoBoost V6 unleashed 365 horsepower and its road-wrinkling 350 lb.ft of torque put it into a category of its own. Not any more. Because the Platinum gets this engine too. All that power doesn’t come cheaply, of course. The fuel economy isn’t stellar, but then again, nobody buys an SUV with three rows and this much power and expects a fuel miser. 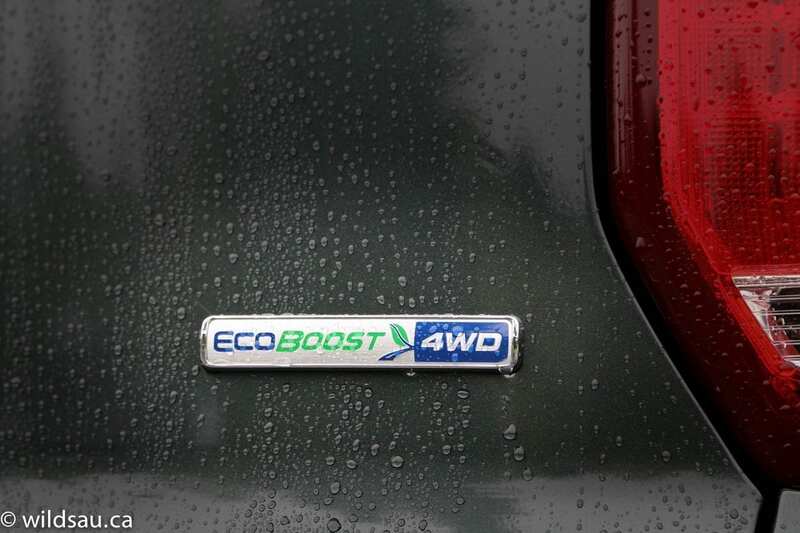 Ford rates it at 14.9 L/100 km (16 US mpg) in the city and 10.7 L/100 km (22 US mpg) on the highway. I’ve come to expect EcoBoost fuel ratings to be hilariously optimistic but was very impressed by our 11 L/100 km (21 US mpg) average over 450 km of mostly highway driving. How can that be impressive? Well, let me tell you about our trip and you’ll see. 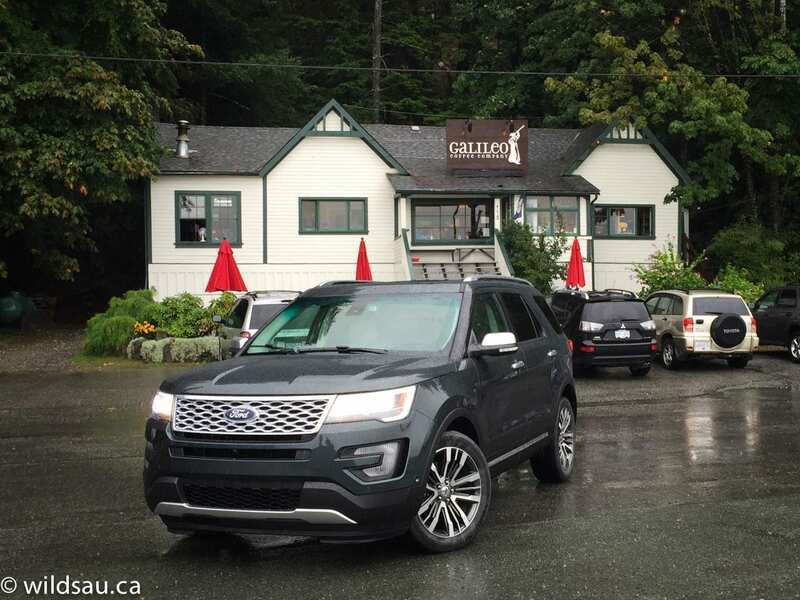 Ford put together a fantastic event for the Explorer Platinum, and framed it with the hashtag #ExploreMore. Their thinking was that we should explore more of what we wanted to explore. Instead of the typically structured and scheduled-to-the-last-minute please-ensure-you-arrive-at-2:17PM-so-you-can-catch-the-shuttle-to-the-5:00PM-dinner itinerary, our trip was left up to us. I mean there wasn’t a single thing we had to do, not a single checkpoint we had to arrive at, and everything between our Vancouver starting point and our Kamloops destination was left up to us. 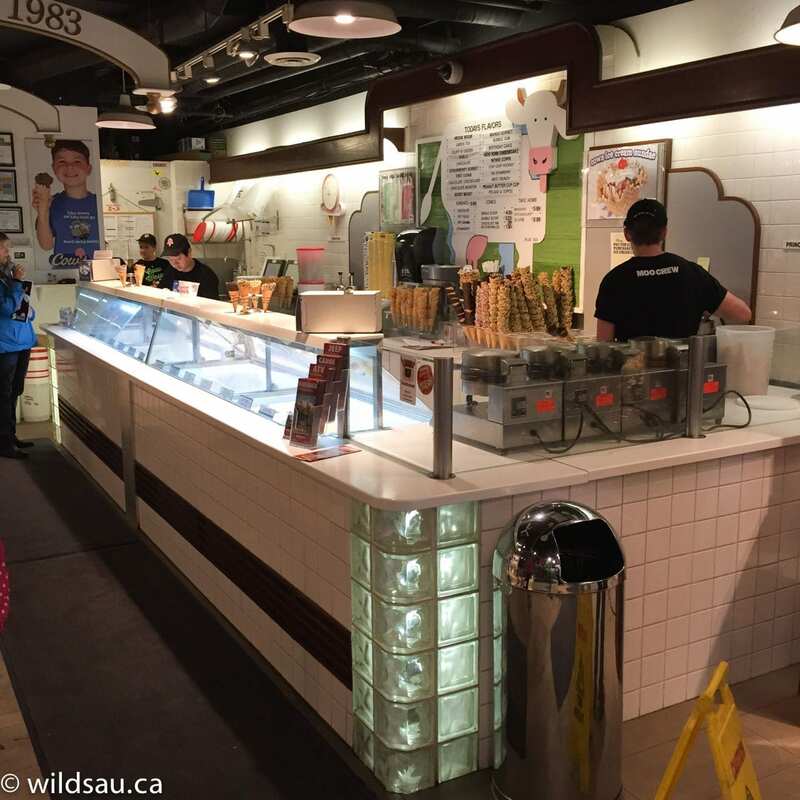 There were 25 suggested things to check out along the way. You could try to see them all, you could ignore all of them, or pick and choose what tickled your fancy. What a cool way to do a trip! Best of all, we got to check out the incredibly lush forests, soaring views of fjords, bays and inlets, mountains, cliffs, hair-raising switchbacks, truly unbelievable altitude changes, and even semi-arid desert terrain all at our own pace. I’ve never enjoyed this much time behind the wheel of a vehicle at a first drive press event, and perhaps that’s what impressed me most of all – time to actually get a feel for the vehicle. 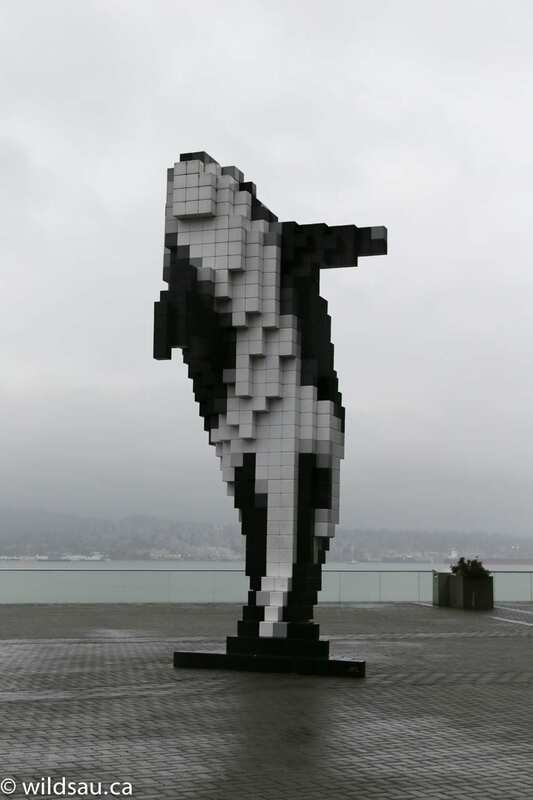 I dropped by the Vancouver waterfront where I saw the famous Pixel Whale right next to the Olympic Torch, watched a few seaplanes take off and land and checked out the Disney Wonder cruise ship that was docked. Then I headed off onto the incredible Sea to Sky Highway. 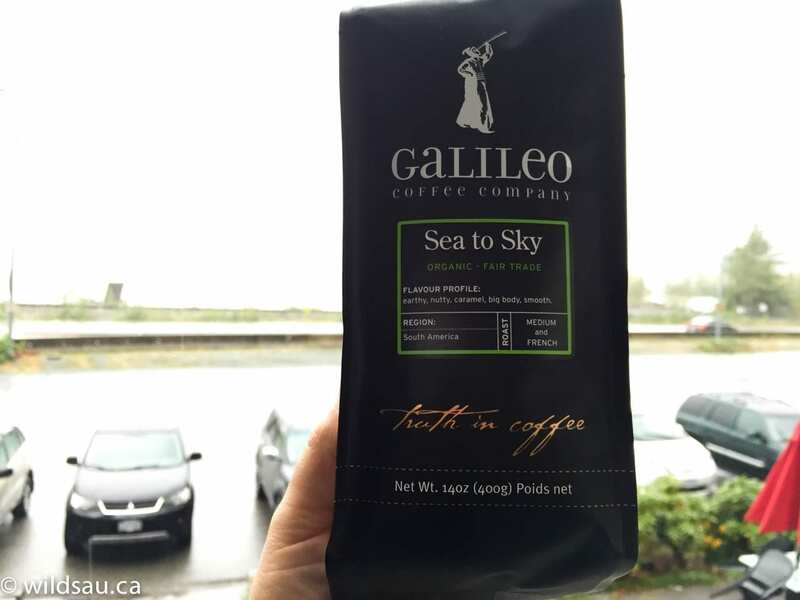 It doesn’t matter how many times I’ve driven it, it’s still a magic stretch of road to me, and as I do every time I’m there, I stopped at the Galileo Coffee Company to see some friendly smiles and to pick up a hot cup of brew and a freshly-roasted pound of beans to take home. I loved the smooth, linear power of the engine as I headed up some of those steep inclines into the mountains – it accelerates with gusto from a stop, cruises along happily on the highway and explodes into something of an action hero when you put the hammer down, making passing a quick and painless move – at any speed. Ford’s 6-speed automatic is decent. It’s not particularly quick, but it’s quick enough, intelligent and very smooth. That’s perfectly fine for a vehicle in this category, although another cog or two would certainly make a difference in the Explorer’s fuel economy. 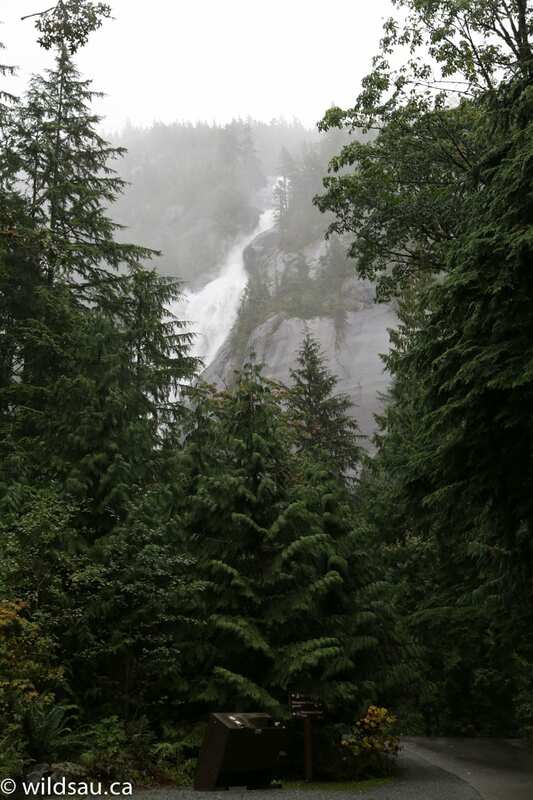 I decided to make my next stop the stunning Shannon Falls, which are so high, they’re impossible to photograph from the base. 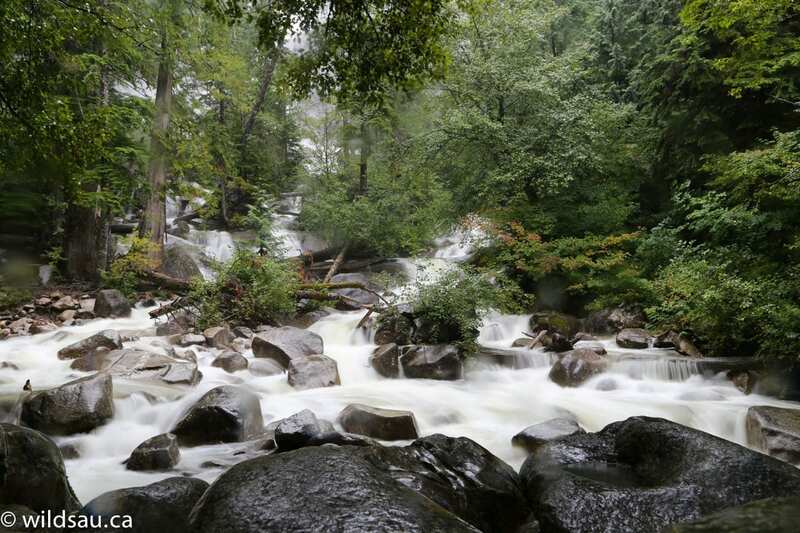 The balance between nature’s thundering power and the tranquility of watching the water at the falls’ base flow over rocks and fallen trees makes this short hike a worthy investment for anyone driving by. 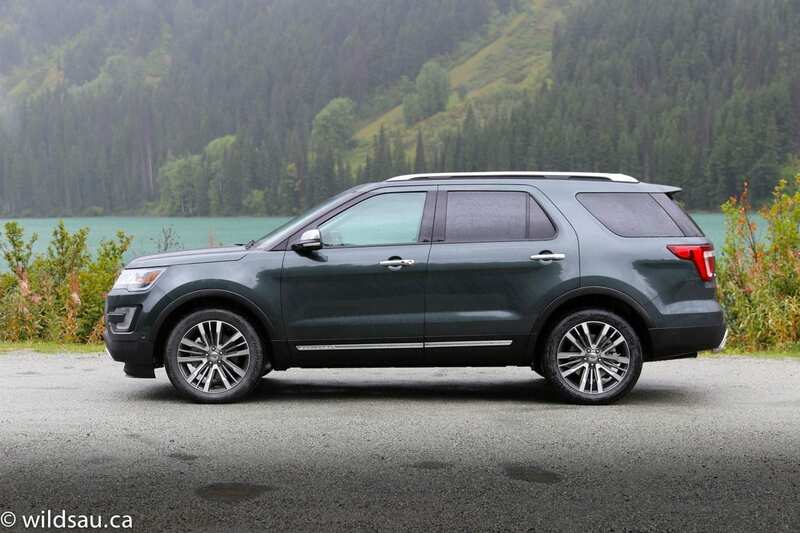 Ford claims this is the quietest Explorer ever, and I don’t doubt that. Even at highway speeds exceeding 120 km/h, there was barely a rush of wind noise and only occasionally, on rougher surfaces, did I hear some very mild road noise. 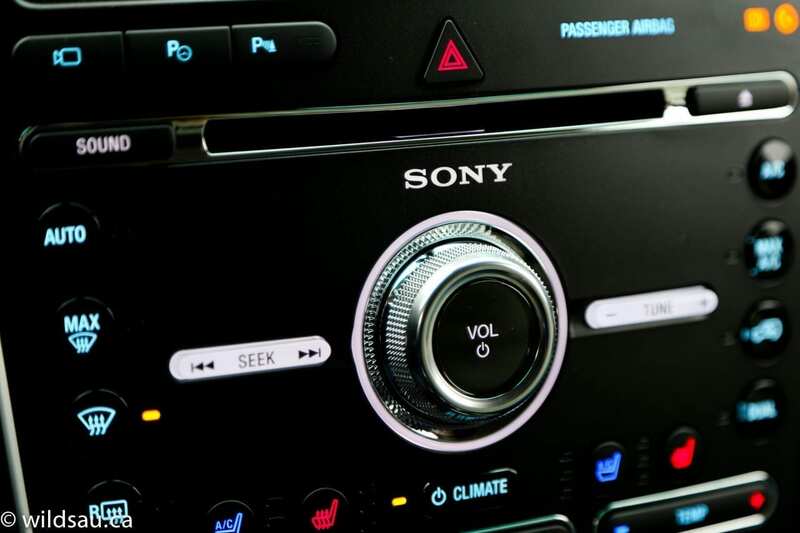 All of this is great, because it allows you to enjoy the outstanding Platinum-specific 12-speaker 500-watt Sony sound system in peace. We were able to check it out at our leisure on the drive, but the demo we got from the Sony rep Tony (how awesome is that?) was mind-blowing. One of the best systems I’ve heard, and even at nearly full volume, nary a rattle was to be heard in the interior. That’s always one of my tests, and I found this reassuring when it comes to the Explorer’s build quality. 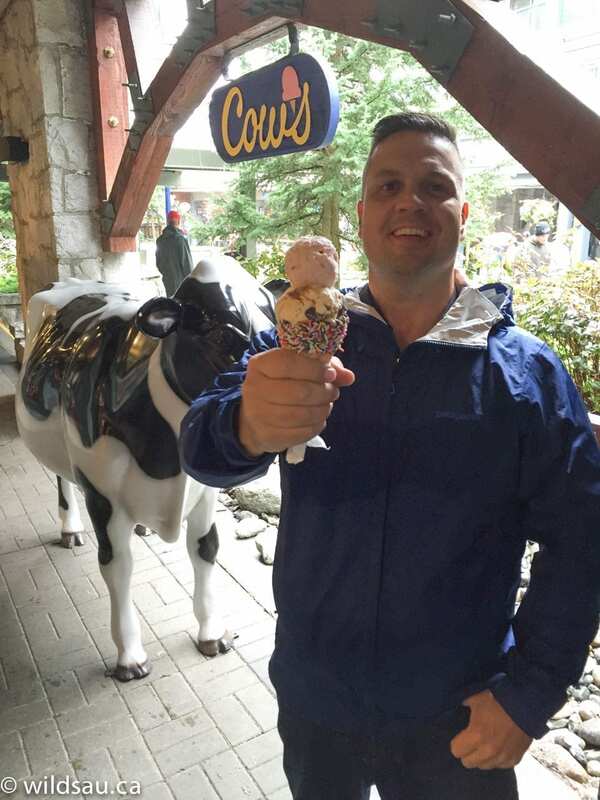 My next checkpoint was Whistler, where I explored the Village and its shops, and stopped in at Cow’s for a couple of scoops of their famous ice cream. Then it was back onto the highway to Pemberton, a beautiful little town nestled into a valley. 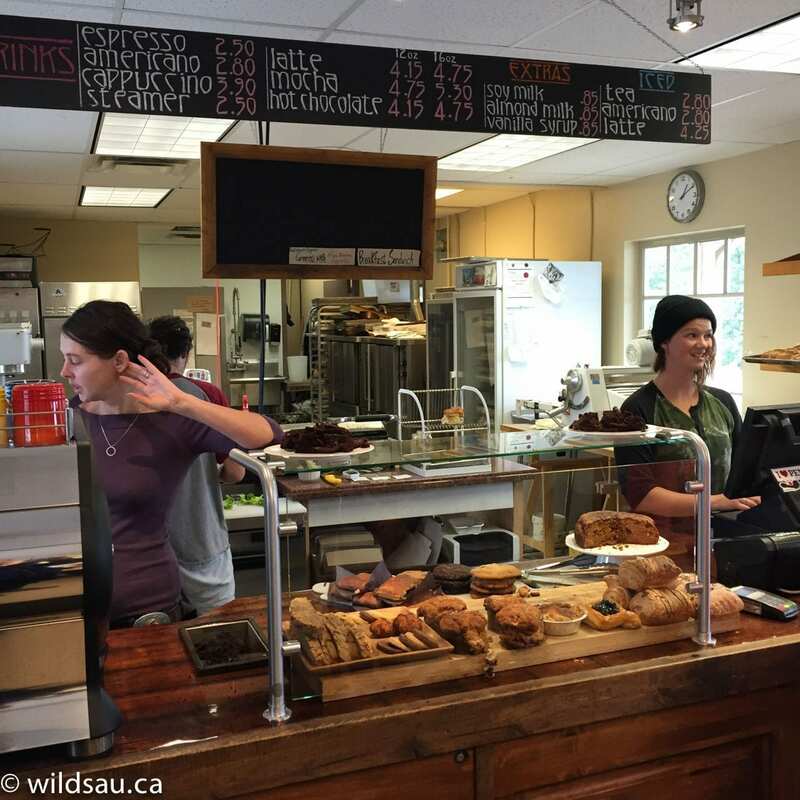 I found my favourite bakery in town, the Blackbird Bakery, and picked up some critical life-sustaining calories disguised as a fresh blueberry strudel. 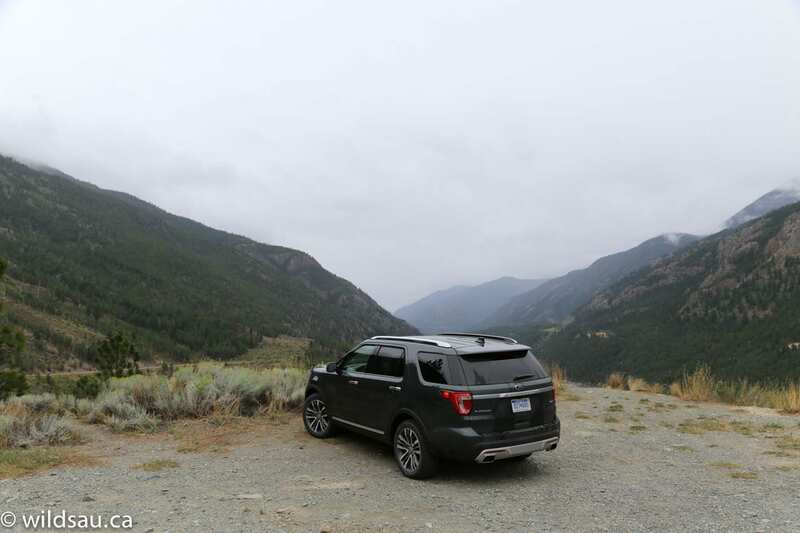 The serene location lulls you into thinking you’re done with the crazy driving. But you’re not. From Pemberton, Highway 99 takes an insane turn, blending an endless ribbon of winding road that combines eye-watering 13% grades up and down mountains, dangerous 180-degree corners (with poor visibility at times) to make for a white-knuckled but pure and totally immersive driving experience. Best enjoyed in a sports car? Definitely. 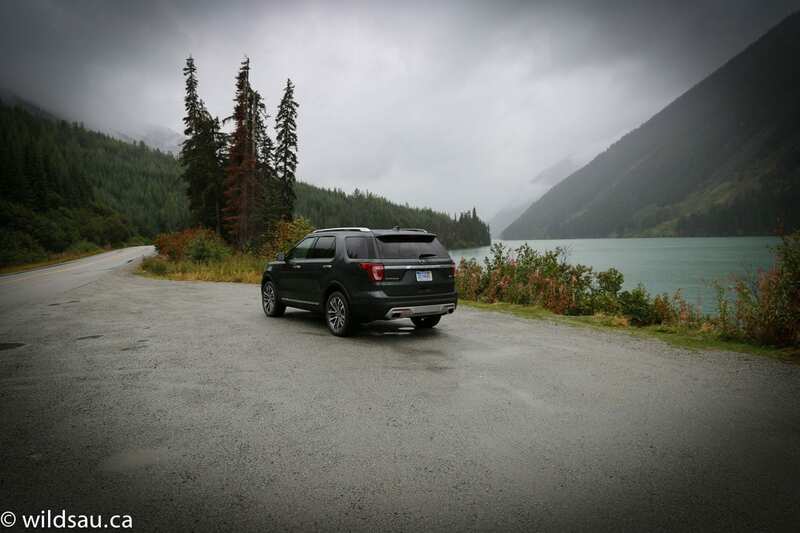 But the Explorer Platinum continued to impress here, with a very well balanced suspension and competent traction – which was handy as it poured rain all day long. The 2218 kg (4890 lb) behemoth took to curves like a champ, feeling more connected and competent than lighter, pricier SUVs with adaptive suspension. Yet the ride remained supple and comfortable, never allowing bumps or road irregularities to come through to the cabin. Along the way to Lillooet you’ll pass two stunning features – Duffy Lake, where the boat launch (a simple gravel incline into the lake) serves as one of the finest backdrops for automotive photography in western Canada, and the Seton Lake Reservoir, where your view is framed by the mountains sliding directly into the water on either side, and if you’re lucky enough, you’ll see a train snaking its way along the north shore, stuck between the ice cold waters and the mountainside plunging down next to it. 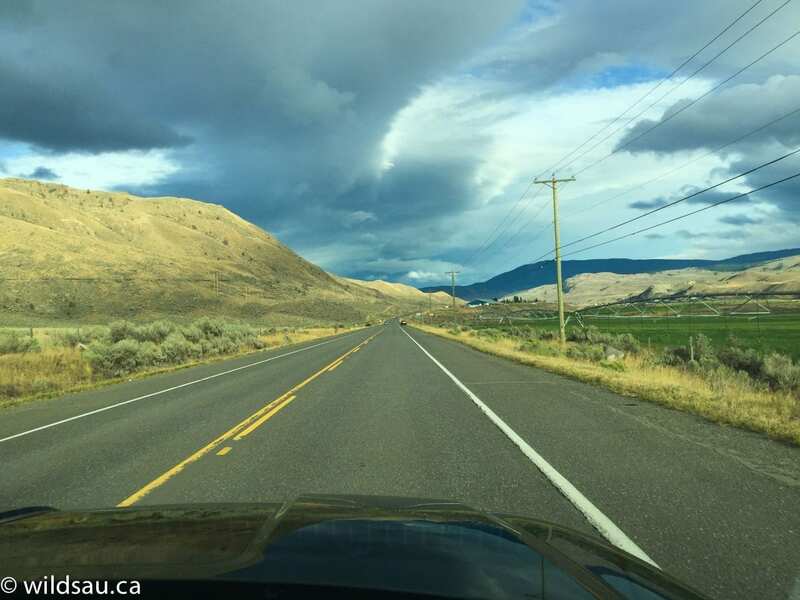 The final stretch, from Lillooet to Kamloops, continues the theme – an endless series of curves, elevation changes and throws in freaky things like single-lane bridges. 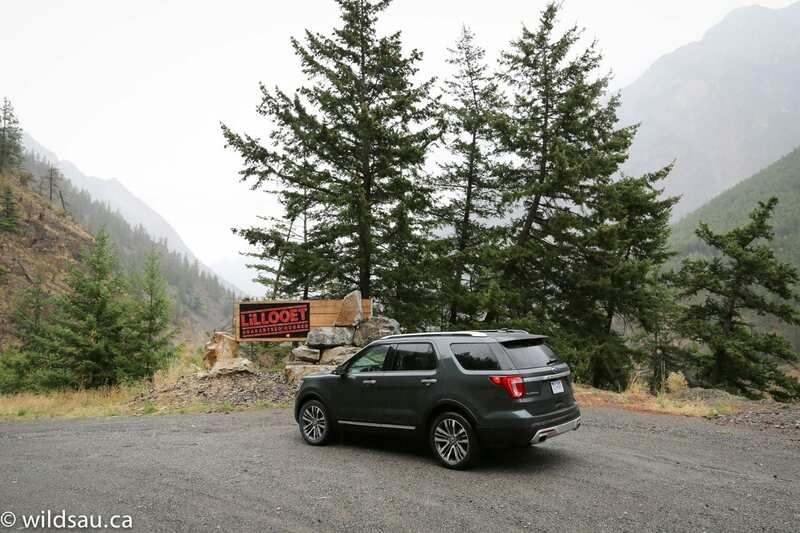 And it rewards you with an infinite number of vistas over the Fraser River valley, as you traverse the suddenly dry almost desert-like terrain, dotted with sparse forests and sometimes nothing more than scrub brush. At the end, you’re rewarded by a drop into another massive valley and into Kamloops, one of the hottest, driest places in Canada. Looking back at the route I drove, it is certainly not for the faint of heart nor the weak of stomach, but I enjoyed every mile of it. And the Explorer Platinum kept up with everything this writer explored. 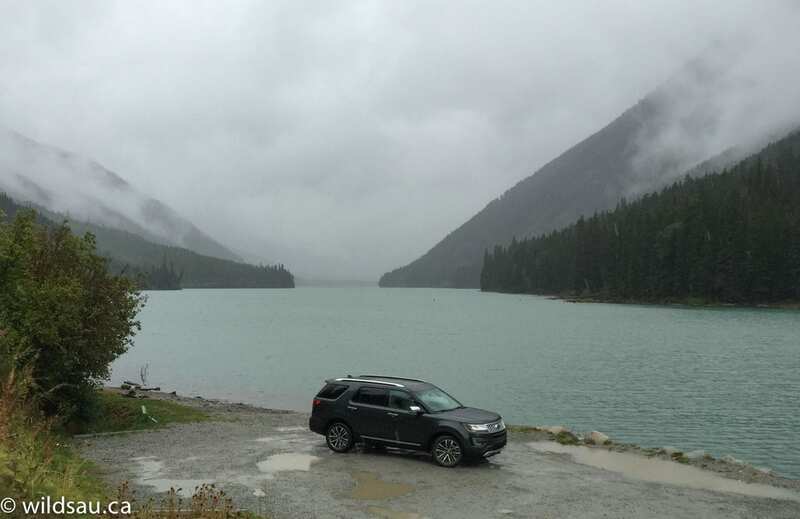 As you can see, I had reason to celebrate the Explorer’s fuel economy after a day of this kind of mountain driving. 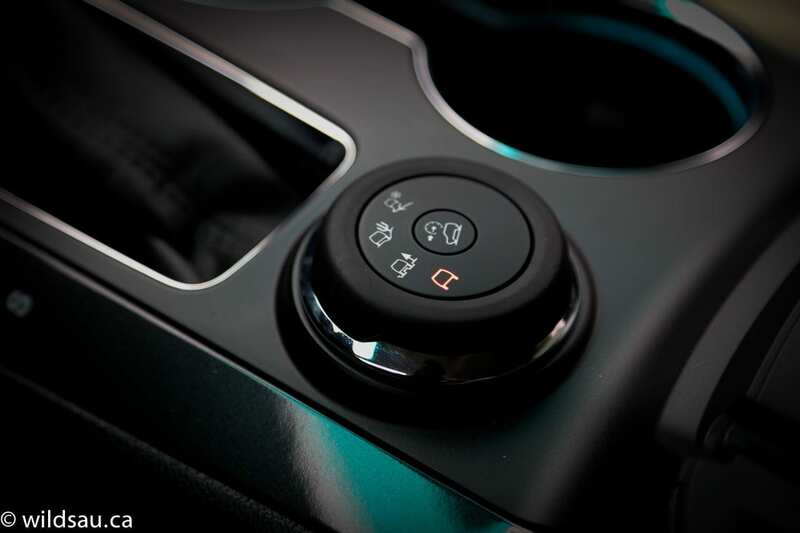 The Explorer does have a rotary Terrain Management controller, allowing you to choose between normal, sand, snow or mud modes, as well as a hill-descent mode. 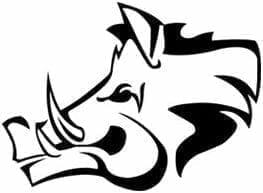 While I did go off the beaten path, driving through some shrubbery and a deep ditch on barely muddy roads and gravel doesn’t count for off-roading so I can’t truly say I tested its ruggedness. Need to tow? It’ll lug up to 5000 pounds. 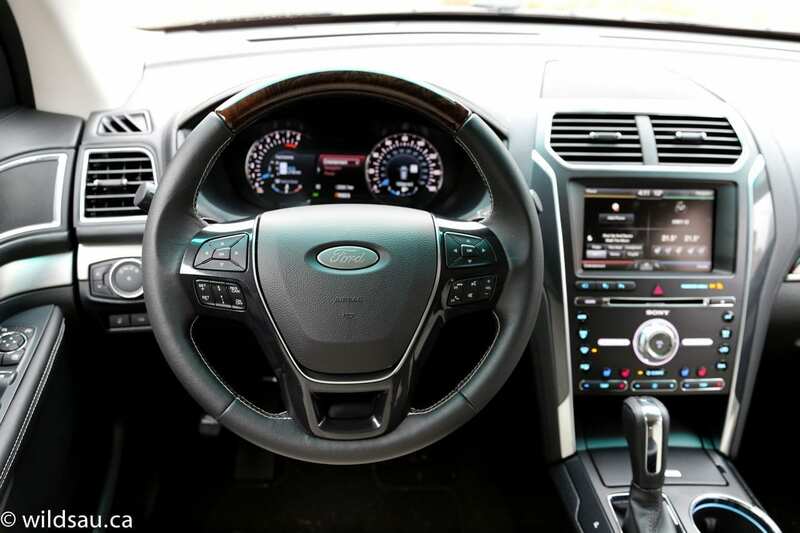 The Explorer Platinum is a nicely styled SUV, that comes as loaded as possible, boasting the best that Ford offers in the luxury, performance, technology and safety departments. If that’s what you’re after, and you’re willing to pay for it, you’ll end up with a credible, authentic and capable SUV – the best version yet of the one that started it all 25 years ago.